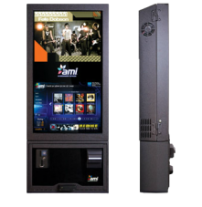 The NGX, AMI’s latest addition to the Rowe jukebox product line, is a streamlined, economically priced, next generation jukebox with interchangeable skins that allow customers to quickly transform its look and shape, right on location. Revolutionizing today’s jukebox marketplace, AMI introduces its first series of interchangeable Smart Skins that secure onto the NGX, enabling the jukebox to adapt to, or stand out from, its surrounding décor. Each skin has the ability to communicate with the jukebox software, adding special graphics and features related to that skin. The NGX jukebox is affordably priced, simple to install, and operators can instantly change the look and shape of the jukebox. Its software enables patrons to quickly find their favorite music, and even suggests additional songs to accompany what they have already picked. All AMI jukeboxes feature a renowned music library, which boasts up to 300 complete, locally-stored albums as well as over 735,000 additional songs. It’s all priced to be an incredible VALUE. Built for what you need NOW, built to become ANYTHING you need tomorrow. Standard skins will be stocked and available for purchase from Rowe distributors. Both skins feature dynamic light shows and custom UI artwork. More designs are soon to follow. Click on the image for a larger view. Its serviceability is practically effortless, requiring just one person for installation, no mounting brackets, and no tools for common service. Our universal computer package houses the motherboard, power supply, I/O controller, and a huge hard drive, pre-installed with selectable music genres for any type of location. Make a grand impression with the Rowe GrandStar, the Internet jukebox that delivers exactly what you want – more music and more help when you need it. GrandStar gives patrons access to a music library featuring hundreds of thousands of tracks and full albums from major and independent labels. GrandStar now comes with smaller, cleaner internals, allowing easier access to vital electronic parts. As with all Rowe jukeboxes, GrandStar is backed by industry-renowned technical support, making sure the beat goes on. Boasts the best music from Sony, Warner, Universal, EMI, hundreds of indie labels and local independent talent. Online, casual and league game play - play anyone in the world from anywhere! Play Mechanix and Raw Thrills take The Big Buck Hunter series and make it Hi Def to create Big Buck HD, the most realistic and entertaining arcade hunting game ever created! All games are online, allowing real time head-to-head competition between players, mini and mega tournaments, location finder, social networking including Facebook and Twitter, all major credit and debit cards accepted. Two configurations: (1) 32" dedicated with LCD fully-enclosed and protected with a glass front, perfect for tight bar locations and (2) Panorama where the operator provides 1080p LCD or LED in 42", 47" or 55"
New ergonomically and structurally improved Big Buck HD gun is universally designed, so they can be designated by operator to green or orange. In Lighthouse, players always start a game where the last player left off – it is known that players who have reached the upper levels of the Lighthouse find it hard to quit the game… The object of the game is to climb the 5 levels up the Lighthouse to reach the Win zone. To climb to the top, Players have 3 tries to stop an arrow on numbers that are ranging from +1 to +4 to go up the Lighthouse, landing on any minus numbers means they head back down the stairs. In the Win zone, the Lighthouse beacon comes alive and shines on the Winner to claim his prize. Valley pool tables offer the excitement individuals look for in home tables with the dependability of commercial quality construction. Our rich colors, trims, cabinet structure, and imported slate are just part of what makes our tables stand out. Valley pool tables contain the quality, dependability, look and feel that is perfect for any home game room or entertainment space. Purchase an affordable Valley home pool table and enjoy the game of pool in your home for years to come. Dynamo® stays in touch with the latest trends in furniture design and appearance and brings them to you with an elegant Hearth Oak look that will complement the decor of any room. All the features players want, all in an elegant design that keeps them coming back again and again. Special leg levelers eliminate the need to lift the table to level it. Hardwood rails are screwed into the table for stronger construction and easy replacement.